Steven Soderbergh's Contagion is one of that rare breed of films that succeeds as both a compelling drama and as a rich and informative movie about science. At the heart of the drama here are the stories of the three women who are Contagion's scientists heroes: a World Health Organization disease detective played by Marion Cotillard, who works coolly and systematically to piece together the puzzle of the origin of a rapidly spreading viral illness; an Epidemic Intelligence Service boots-on-the-ground, brave first-responder (a studiously understated Kate Winslet) who puts into place the critical early public health care measures to deal with the emerging pandemic; and the luminous Jennifer Ehle, as a smart CDC virologist who labors tirelessly behind the scenes to understand the nature of their deadly opponent and to devise a vaccine to defeat it. What makes these stories so engaging is not only that they weave important and realistic medical science roles into the multifaceted plot of the ensemble film, but also that the woman executing them do so with compassion and unassuming self-sacrifice, keeping their heads while those about them are losing theirs, creating a calm, efficient working center at the eye of the swirling global disease storm. It is also interesting to note, reversing conventional gender roles, that it is the CDC head honcho, played convincingly by Laurence Fishburne, who fumbles the ball by letting his personal attachments get in the way of his doing his job. 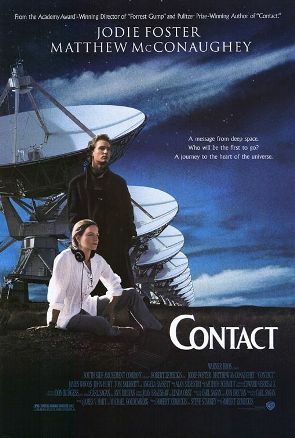 Off hand, I can think of only one other popular film that delivers so much unvarnished science, and that is Contact, which also happens to feature a brilliant, fearless female scientist (Jodie Foster, of course). 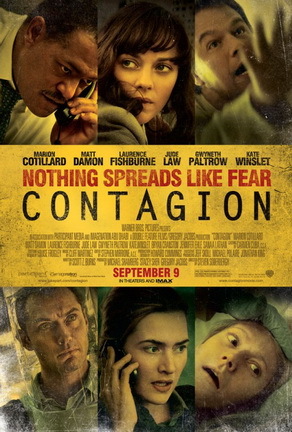 The fact is that we learn a lot from Contagion, and the science it communicates rings true, even allowing for the concessions made to narrative compression. (For example, vaccines, in real life, do not confer immediate immunity.) This level of detail and concern for accuracy I attribute largely to director Soderbergh, whose goal was clearly to offer us an ode to medical science and to public health workers. The movie pauses for a quiet exposition on epidemiology - Winslet takes to a whiteboard to explain the mathematics of disease transmission, complete with variables and subscripts, no less - and for a meditation by Ehle at her father's bedside - a short discourse on a Nobel prize won for determining the true cause of ulcers. Can you imagine? These digressions into the nuts and bolts of science - and there are many of them - would not have made it into a lesser script, much less the final cut of most films.That they survive and are showcased here are a testimony to Soderbergh's independence as a film maker and to his ability to realize Contagion as the remarkable personal vision that it appears to be.